Raccoons (Procyon lotor) are foraging omnivores that typically search for food at night. 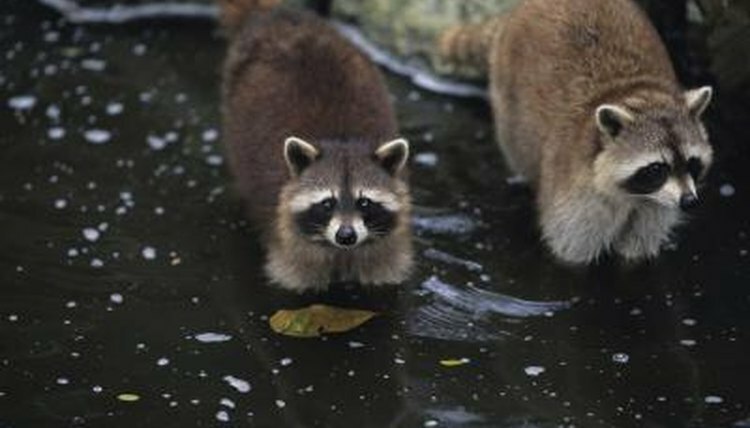 You may have heard them knock over your trash cans in the evening, as these furry critters will eat everything from berries to garbage. Raccoons sleep during the day, typically in dens, and they can sleep for long periods when food is scarce. Raccoons are nocturnal, so they search for food between dusk and dawn. Males are typically solitary, but females and young will often stay together in dens and when feeding. Raccoons consume more in the fall to have fat stored because they spend a large portion of the winter sleeping. They don’t hibernate and can be woken, and their metabolic rate is the same as when they are fully awake. Raccoons live in dens. Female groups with young may even share a den. While they don’t make their own dens, they will use old dens from other animals. Rotten logs or hollowed out trees are common nests, and they may even sleep on the ground during the spring or summer. During harsh winter weather, raccoons have even been found sharing dens with other species, including skunks.